Please say hello to our third tabby girl... 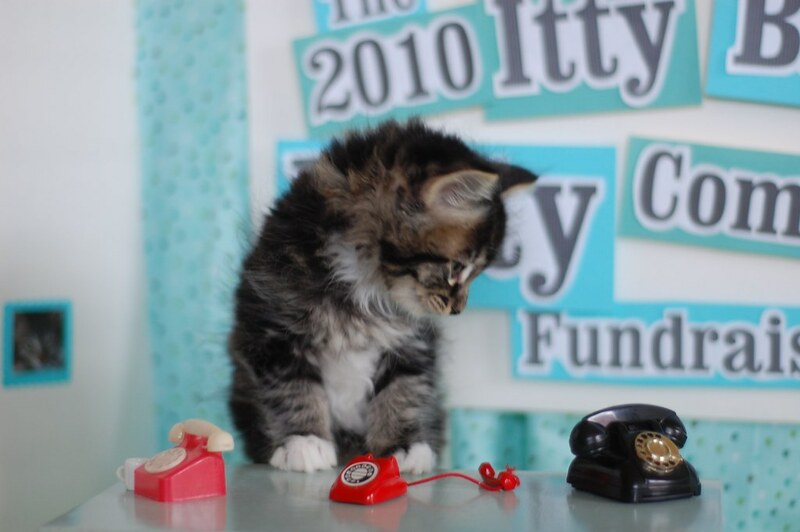 This sweet little thing was kind enough to volunteer for the first shift on the phones. Oh, Dear. I'm a wee bit nervous. Riiiiiinnnnggg. OK, here we go. Deep breath. Exhale. 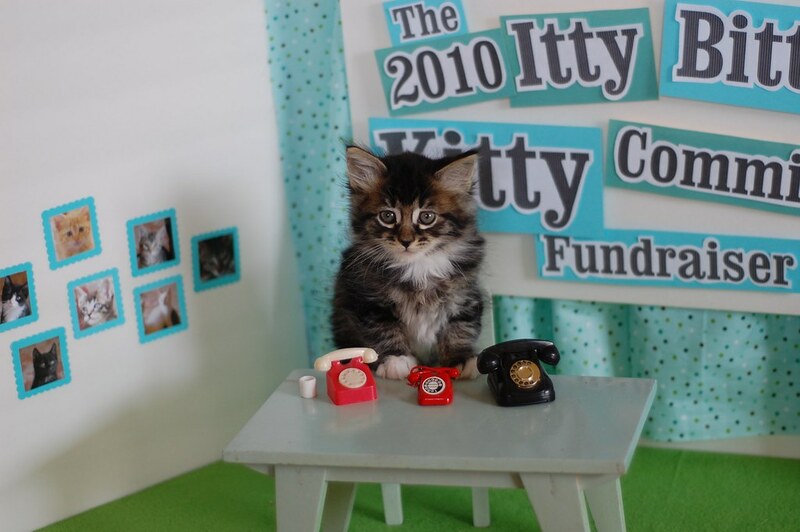 I mean ITTY BITTY Kitty Spaghetti Fundraiser.... Argh. That's not right. This is such a tongue twister. 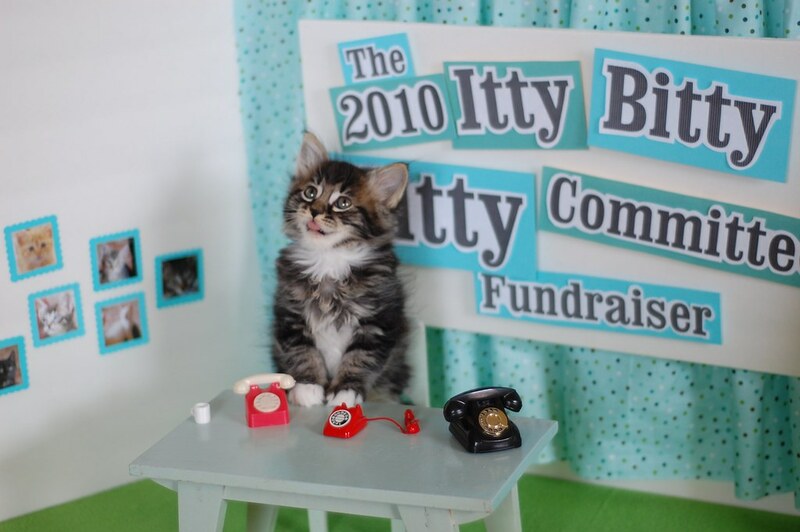 THE ITTY BITTY KITTY COMMITTEE FUNDRAISER. Finally. There, I got it. Hello? Are you still there? Hello? Hello? I think she might just need a little more practice. Perhaps you should try donating online instead. Click HERE to make a pledge today. ooooooh squeeeeee! she is such a cutie! Holy crap! That was funny! What did you put on her mouth to get her licking like that? Excellent post. You will catch on quick, little one. 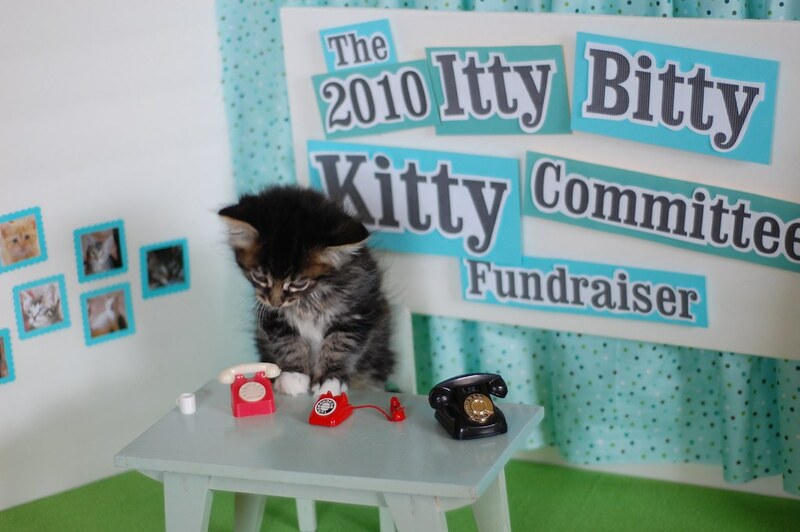 And in your cathood you will be able to tell itty bitties about how you helped raised money for the IBKC back in 2010. 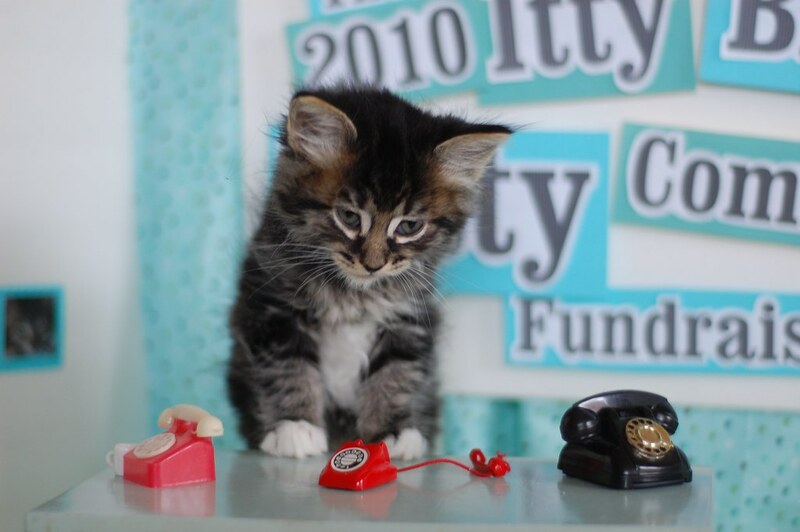 Itty Bitty Kitty Spaghetti!!!!! OMG...I don't think I can make it to the end of this fundraiser. My heart is getting full to bustin'! And my cheeks hurt from smilin'! Aaaaaahhhhhh, the attack of the tiny tongues! Who can endure the squee-osity of it all? IBK Spaghetti? I sense a rhyming contest coming soon to a computer near you! Oh soooooooooooo cute! Love the tongue twisting. Absolutely hilarious! How cute is she with her little tongue sticking out? Look at her "mod" eyeliner! Like a fluffy Twiggy. I Love her! Awwww - nerves and floof can make an awesome combo! That was just plain wonderful! 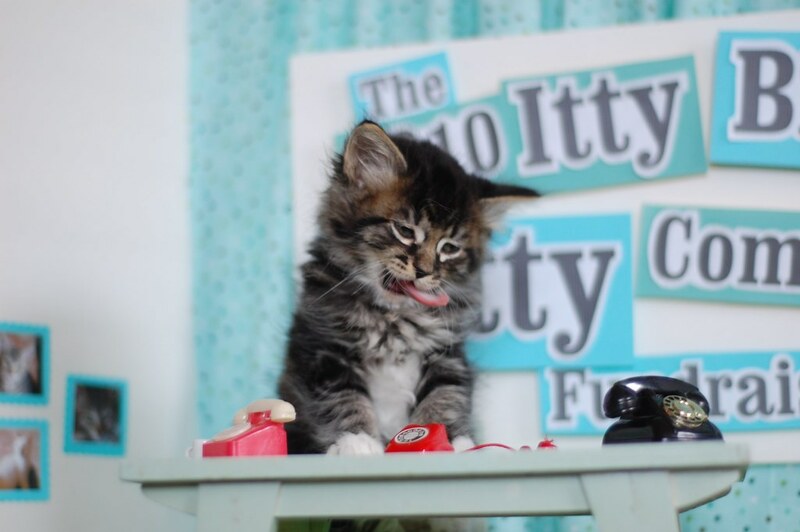 Poor little girl kitty has trouble with her nerves, but she eventually pulls it off. What a sweet posting and story -- just lovely, Laurie! P.S. I sometimes stumble on the name, too! She has it all, the tiny mittens and bib, the huge kitten eyes, and of course the floof. 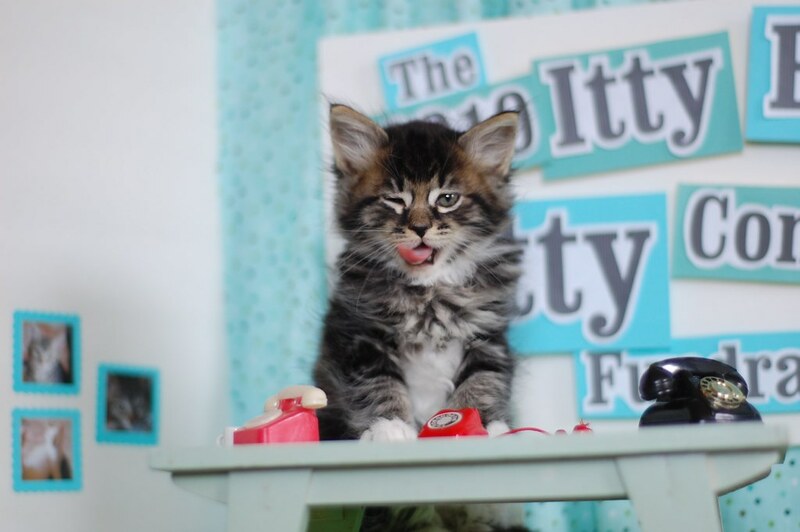 itty bitty kitty spaghetti killed me. Hehe, you are so funny! oh my goodness...this is SOOOOOOO cute and funny! Really, I'm wiping my eyes cause I'm laughing so much!!! oh no not again... *falls off chair and drags limp body back to desk* the purrfect eyeliner, the shadow one just so. i cant stand it. the stripes!!! the floofage. is too much. i give up. i'll take one of each. sign me up Laurie! This is so adorable that I am in between laughing and crying at the same time!! Love it!!! At least she's dressed for the job in her tiny pinstriped suit and crisp white blouse. 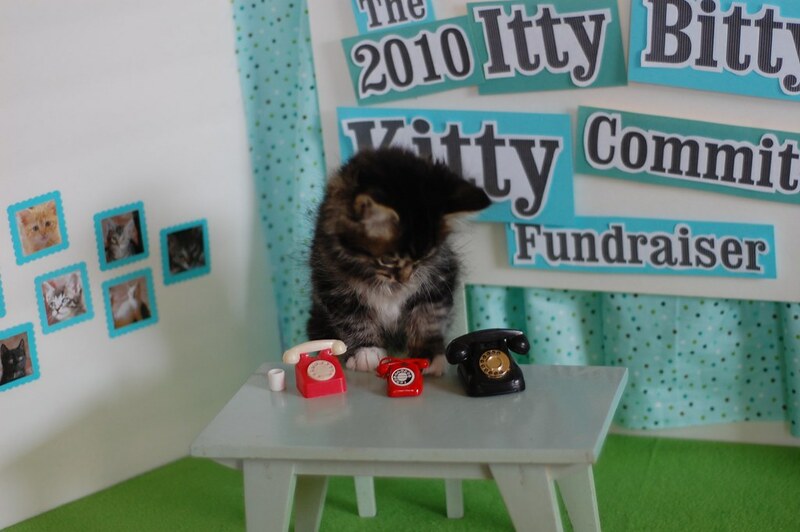 "Hello, Itty Bitty Kibble Committee." Wot an adorable post! We LOVE it! Yoo deserve to raise LOTS and LOTS of cash! is this a "blond" kitty?. Love the mug Laurie. God is in the details. Too funny!!!! The tongue twister pics! I am partial to lynx points, but I must say....I WANT THEM ALL. They are each soooooooo cute!!!! My favorite part is how you always go back to a picture of the cat just sitting there again. As if, "What? Oh. No. Nothing happened while you were gone. It's been pretty quiet."